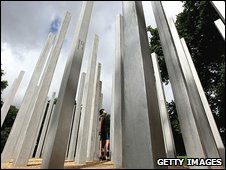 The memorial in Hyde Park for the victims of the 7 July London bombings has been vandalised. A "couple of words" were written with a black marker pen on one of its 52 steel pillars, said a spokeswoman for the central London park. Staff responsible for the maintenance of the park are removing the graffiti. Dania Gorodi, whose younger sister Michelle Otto died at Russell Square in 2005, said defacing a memorial which stands for respect was "outrageous". The tribute to the 52 people murdered in 2005 was unveiled by Prince Charles on the fourth anniversary of the bombs. They were killed when four suicide bombers detonated explosives on board three Underground trains and a bus. Ms Gorodi, 52, who lives in north-west London, said: "If they (the vandals) are capable of vandalising a memorial, which is the symbol of a tragic event and respect for the dead, then the vandalism is a symbolic act of terrorism. "I don't find it just sad but outrageous that somebody would do this. "They don't give a damn about what we believe in," she said. She hoped that the person responsible for defacing the memorial was caught and "made an example of". Staff at Hyde Park found the markings on Monday afternoon. The Royal Parks spokeswoman said: "Today we were saddened to discover a small amount of graffiti on one of the pillars of the 7 July Memorial. "We are now in the process of removing the graffiti and the police are aware of the situation." The pillar that was defaced bore the inscription "Kings Cross - 08.50 - 7th July 2005". Westminster City Council deputy leader Robert Davis said: "To choose to vandalise a memorial which is a tribute to those who lost their lives in the July 7 bombings is extremely cruel and shows a lack of human feeling and decency. "I am shocked that anyone could be so heartless."